“THE HISTORY AND PIONEERS OF BLACKWOOD” BOOK. Balt Camp, and Able’s Mine Bullarto, Blackwood – Baltic Refuges as Migrants. 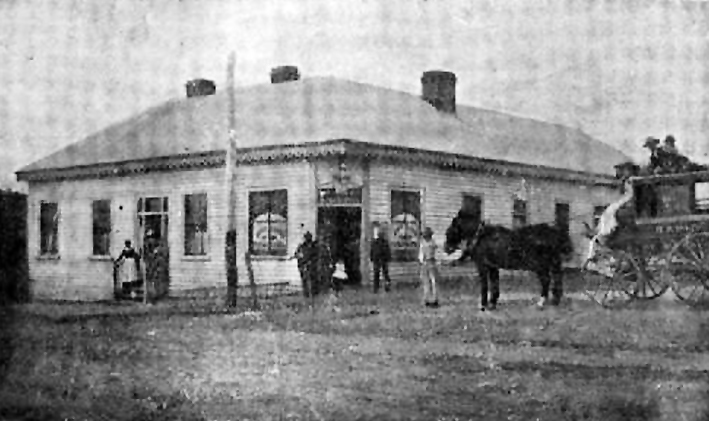 Blackwood & District Historical Society and Police Stables Museum. Blackwood Avenue of Honour and the Honour Boards W.W.1. Betsy Blackham, James Hickman and James Unwin. Maggie Gelletly (nee Sweet), wife of John Gelletly. Matthew Rogers vault in the Blackwood Cemetery. Paul Hester, drummer for Splitz Ends and Crowded House death – Buried Blackwood. Blackwood Mineral Springs Caravan Park. Captain Moonlight – folk-lore linked to Blackwood. Accident to John Tenni and Benefit Concert – Death of Mr. George Gallop. Blackwood June 1896. Fatal accident at Blackwood. Inquest on Louis Schinkle and Antonie Olson who died at the True Blue Mine, Barrys Reef 1870. EASTER MONDAY MINE, BLACKWOOD – Some early history. HENRY GRIBBLE – Pioneer of Blackwood. 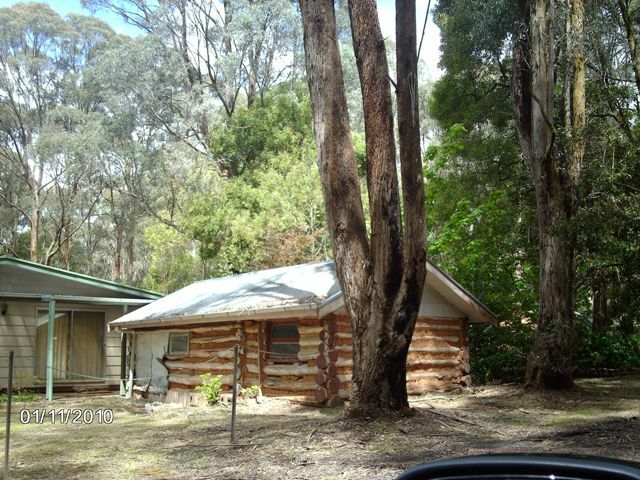 HOLIDAY HOUSE FOR RENT, BLACKWOOD – ‘Wannawong’ . ‘Wannawong’ – Holiday house history, Blackwood. 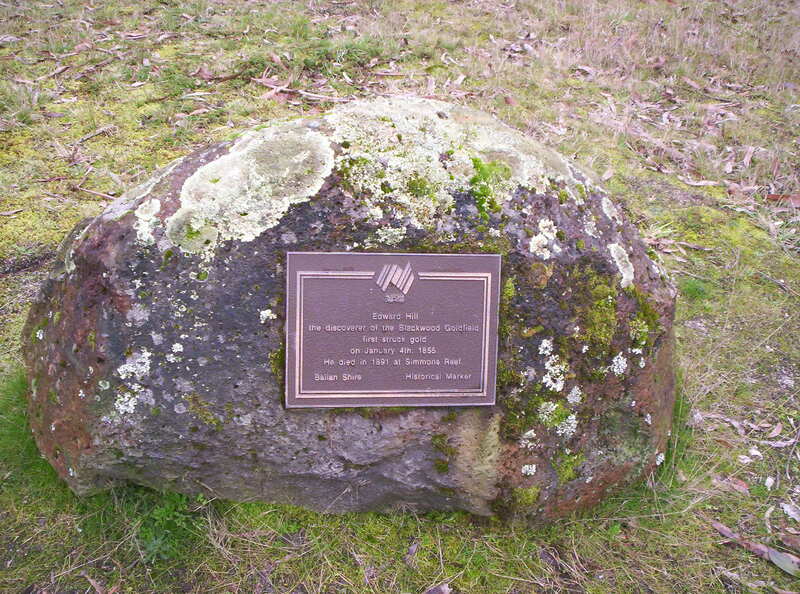 Isaac Povey, buried on Deadman’s Hill, Simmons Reef, Blackwood. Photos of People and Pioneers of Blackwood. Sarah and William Edlington, and daughter Harriet and family. Some History of Simmons Reef, Blackwood. All Saints Anglican Church, Blackwood. Rip Van Winkle mine, Mineral Springs, Blackwood. **** AS FROM SATURDAY 30TH JUNE 2018 THE HISTORICAL MUSEUM WILL BE OPEN ON MOST SATURDAY MORNINGS FROM 11am – 1pm – unless members cannot be there. (if planning to go check with the President – Allan Hall on 53 686 537 to make sure the Museum will be open). *****As in keeping with other Historical societies, we welcome enquiries about family or local history, which should be made by contacting the Historian at margothitchcock@bigpond.com . The cost of this service is appreciated with a small monetary donation for the time and information required. 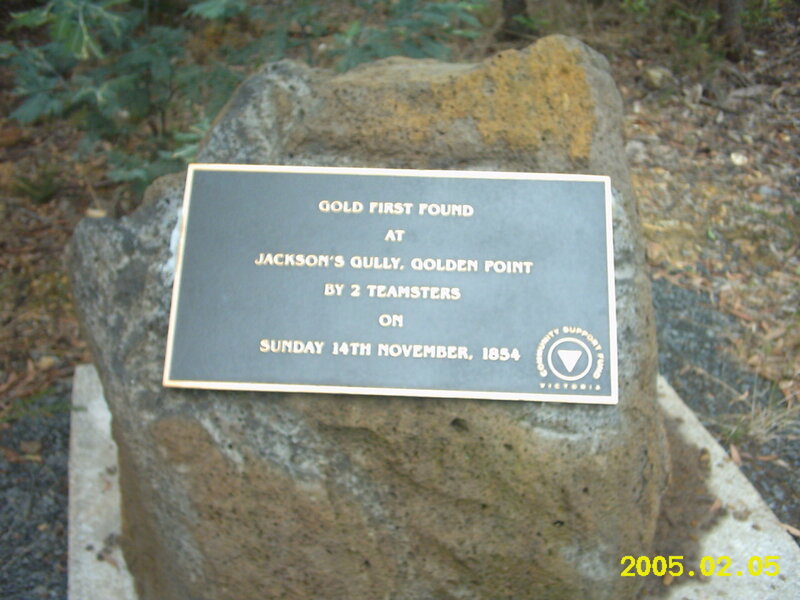 Gold was first found at Jacksons Creek, Golden Point, Mt Blackwood, Victoria, on Sunday 14th November 1854 by Harry Athorn and Harry Hider while filling their ‘billy’ with water to make a cup of tea. After much gold was found, miners turned their attention to digging large holes and shafts where they discovered gold in some of the rich quartz-reefs. Initially discovered by James Simmons to the west of the town, at Simmons Reef, this area was to produce much gold by various mining companies. This was followed up by the discovery of the extension of the line of quartz reef at Barrys Reef where the rich Sultan mine and others yielded tons of gold. The Sultan mine was reported to have yielded 65,801 ozs of gold from 1869-1880 to a depth of 900 feet. Blackwood was originally called Mt.Blackwood with townships of Red Hill, Golden Point, Barry’s Reef and Simmons’ Reef. Close to Blackwood was Blue Mountain – now called Blue Mount. Also Green Hills, Greendale, Ballan, and Trentham. Bacchus Marsh is the closest biggest town before you get to Blackwood and Kyneton the closest town the other way past Blackwood. Blackwood today, with its timber cottages, is situated amidst the eucalyptus-covered hills which attracted the earliest settlers with their promise of instant riches. Today Blackwood is now little more than a memory of the thriving settlement which existed, in the late 1850s. It is mostly a small township made of some approximately 200 residents plus many houses that are used as holiday homes, plus cottages which are available to rent. 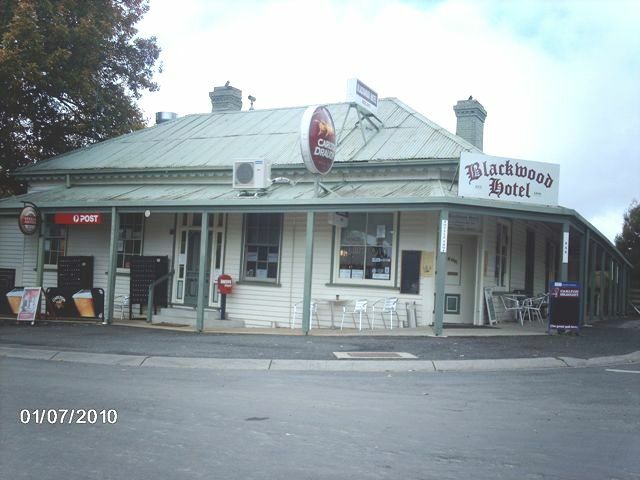 Of interest is the Blackwood Hotel, dating back to when it was built in 1868, where old photos can be viewed, and good meals can be served and where you can met some locals in the bar.